I had come across this Prophecy of the Six Kings before in my readings surrounding the Plantagenet kings, but when writing ‘The Queen’s Choice’, it suddenly became very pertinent because of its influence on the events of Henry IV’s reign. I had to give it some serious consideration. Where does this prophecy come from? Its origin is shrouded in myth and legend, but all the more attractive because of this mysticism. 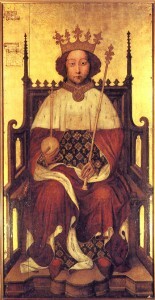 It was said to have been written down about 1312, at the time of the birth of Edward III. It was certainly the most popular prophecy of the 14th century. It was believed to be Merlin’s response to King Arthur’s question about the ultimate fate of the kingdom. 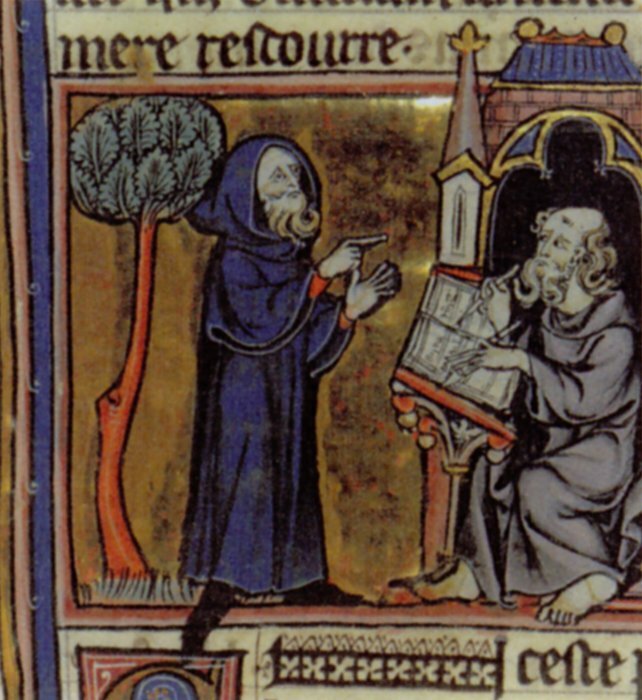 Here is medieval Merlin dictating his thougths to a scribe. The six kings who would follow King John were likened, by Merlin, to six beasts. And this is where my writing picked up the story within the prophecy. 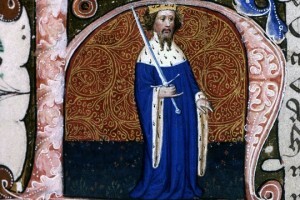 As Edward III’s reign progressed, the accuracy of the prophecy became clearer in his ‘boar-like’ qualities. The prophecy said that Spain would tremble, the boar would sharpen his teeth on the gates of Paris, the boar would regain all the lands of his ancestors, and more. To a superstitious age, all seemed to happen as was foretold. Spain was defeated in a naval battle at Winchelsea in 1350, Edward’s successes at Crecy and Poitiers need no further explanation, all culminating in the English achievements in regaining territory in Europe in the Treaty of Bretigny. 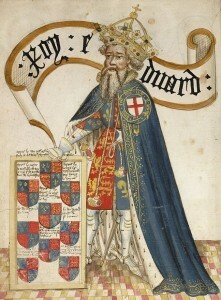 This is Edward in a contemporary image, showing him resplendent in his garter robes. With this apparent proof in mind, many accepted Merlin’s prophecy as a framework for God’s plan for the on-going English monarchy, and because Edward III’s reign seemed to be a truth, Englishmen living in the reign of Edward might look at the rest of the prophecy with some foreboding. The next king after Edward III would be another lamb. Hardly the Black Prince who had shown less than lamb-like characteristics in his military career. 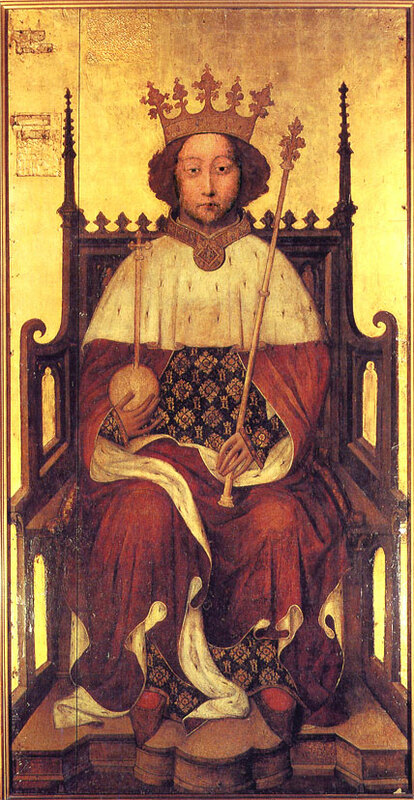 It would certainly be a more fitting description for Richard II, shown here in the first contemporary portrait of an English monarch with all the regal trappings, now to be seen in Westminster Abbey. But then there was a further prophecy attached to Merlin’s foreknowledge. Neither Edward, the Prince of Wales, nor Lionel, the Duke of Clarence, would wear the Crown of England. Ultimately the crown of England would pass to the House of Lancaster. Was this another facet to the enmity between Richard II and Henry IV, exacerbated by these prophecies? Richard seems to have taken them seriously. The antagonism between the legitimate Plantagenet line and the House of Lancaster was thus in existence long before Richard and Henry Bolingbroke were born. 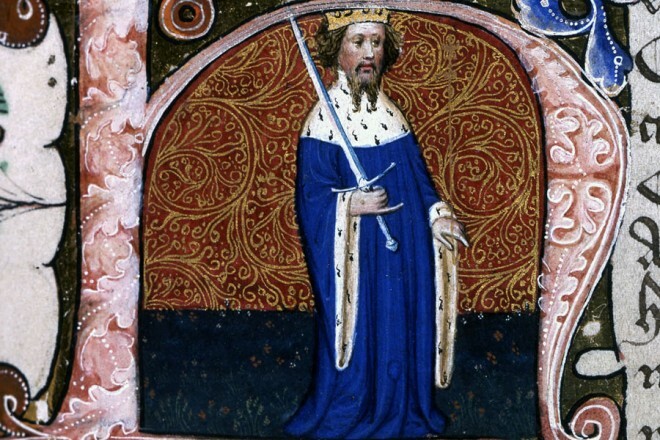 The sixth king after King John – this would be Henry IV, which became very relevant to me – would be the mole – a ‘moldewarp’ – and would have a rough skin like a goat. Henry might well consider this to be true for himself, when he was struck by the severe skin complaint that troubled him through his final years. Here is Henry in a contemporary portrait from an illuminated initial in The Great Cowcher of the House of Lancaster. So who were these creatures, the dragon, the lion and the wolf? The Percy Earl of Northumberland was the dragon from the north. Edmund Mortimer was the lion out of Ireland. Lionel, Duke of Clarence, Edmund’s royal grandfather, had been governor of Ireland. Owain Glyn Dwr was the wolf from the west, emerging out of Wales. Together these three made the Tripartite Indenture, planning to oust Henry and divide England between them. 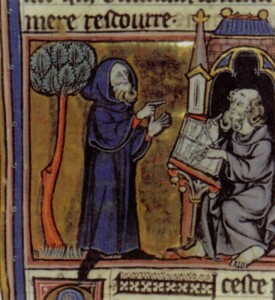 We cannot wonder that both Richard and Henry felt the heavy pressure of ancient prophecies on their shoulders. We cannot wonder that Richard felt threatened by his cousin Henry. And so to my celebratory ‘giveaway’. 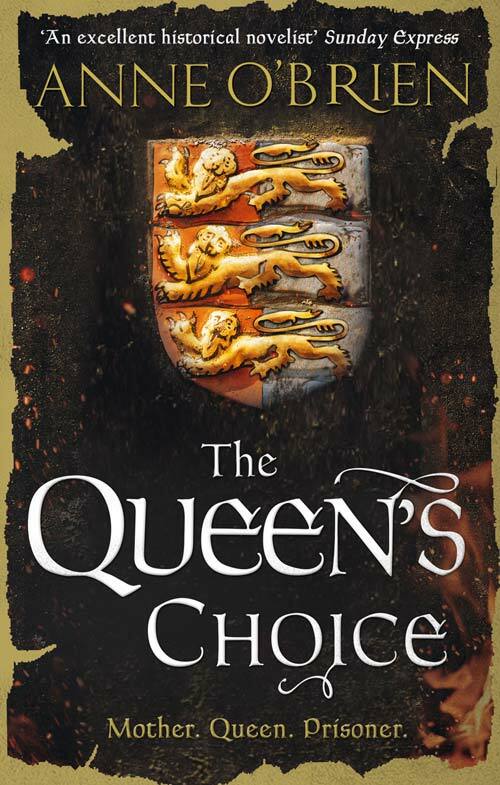 To claim your chance to win a signed copy of ‘The Queen’s Choice’ please leave your name and a comment below. Anne O’Brien in the Independent on Sunday The Witch of Leeds Castle. This would be a fascinating basis for a historical/fantasy novel. Merlin always stirs the imagination. Maybe this had an influence on Henry VII calling his elder sin Arthur. Fabulous post, Anne. Prophecies are so fascinating – that their mere existence can influence people’s actions and reactions is incredible. Their significance often goes unappreciated. Congrats on the new book Anne. It looks fascinating and a great read. What a fabulous and informative post. I love all things from this time period. I love historical novels more than any other kind, I can’t wait to read this one! Fascinating. I had never heard of the prophecy of the six kings before. And it is astounding that they truly believed that those prophecies could determine their fate. I am just starting to immerse myself in this period of English history (my field is the English cathedral music tradition), and as an American it is a bit of a stretch to keep any of it straight. But I love the kind of research you are doing, and am glad to find some kindred spirits! I’d never heard this prophecy before! In a superstitious age, it must have had quite an impact on important decisions that were made. Great concept. I look forward to reading this. An interesting thought on the tripartite- there are enough dragons at Alnwick to work for the Percys I am sure. I hadn’t heard this before. I love reading all the information and research, bringing out another part of history I am falling in love with. Fascinating, I can’t wait to learn more about this and the period. So if the prophecy was well known, it sounds like Owain Glyndŵr, Edmund Mortimer, and Henry Percy simply used it to undermine Henry IV for the own political gains? Also, given the prophecy wasn’t written down until the Birth of Edward III, do you think it’s likely that it might have also been “modified” to some extent for political purposes given the Romance of the Legend of Authur, or even completely made up? A wonderful prophecy with so many facets. Surely a fabulous book will follow from this inspiration! As an avid Bible reader/student, it’s interesting that Merlin would use the description of different “Beasts” found in the Bible to answer the question that was put to him from, King Auther as to the “ultimate fate of the kingdom.” It’s always interesting to read how ones use the Bible prophecys. Anne, your books are wonderful reading. I’ve always loved the history in the British Isles and I learn something new with each book. I can never get enough of history. Interesting stuff! I have not encountered this prophecy before; I am particularly intrigued by the Glyndwr connection. I am not a great Henry IV fan, but he is saved, in my eyes, by his apparent affection for his Queen, so I think this book sounds very good and I would like to read it. Just wonderful Anne. Thank you! Another fantastic piece of history written so it’s easy to absorb.! Just like all your novels that I have to plan to read as I know that once I’ve picked them up and started I become so engrossed and transport to the era. Many congratulations on another fantastic novel and I very much look forward to your next project. It would be a great honour to win a signed copy and have it on my bookcase. Fascinating subject. I can’t wait to read your new book. Congratulations! I never made the link between the prophecy and the attitudes before, probably because I grew up on the wrong side of the pond and haven’t steeped myself in history as much as I should have. I love how you entertain us and also teach us so much in your writings. Well done!!! Best of luck to all the entries in the contest, and Anne, please stay well and keep writing. I hadn’t heard that prophecy, and its interesting to think did things happen in reaction to the prophecy, did it affect decision making ? was it changed slightly to influence things…who knows Great reading. Have really enjoyed your interesting posts on Facebook. Thank you for all your wonderful books! Anne we are new to each other. I am glad I came across your post and I look forward to reading your books. I love the history of my homeland. Great article. Can’t wait to read the book. Great to read these posts. Prophecy is such an interesting subject, because it can be interpreted differently in hindsight than in sight. Also it can be amazing how predictions of the time the prophecy is being fulfilled are wrong because he event predicted has not happened. Would enjoy the chance to read your book, I must add it to the list. Looking forward to reading your new book. I am a long time Anglophile, making me the odd duck in my family. We all walk around with a book in our hand, I’m just the only one who knows what they are missing out on. Best wishes. Happy for you, Anne! Can’t wait to read this story. This prophecy is something I have never heard of before. Your book is right up my alley and I look forward to reading it. This is such an interesting post. I love reading books based in these periods and it’s interesting to see how a prophecy back then could influence people. I really enjoyed reading your blog post…history is wonderful !! I had never heard of this prophesy. I wonder if Edward III invented it or was it a real prophesy that was handed down from early English history. Whichever is true it is intriguing. Can not wait to read your latest book. I have loved everything you have written. Thank you Anne for bringing history to life. Love your books and look forward to reading this one. Fascinated with Merlin prophecies and there impact. Need to read more of these prophecies. Any suggestions? I hadn’t heard of this prophecy, intriguing! I very much enjoy your books especially because you write about characters that are not so familiar as say Henry VIII and his wives. I enjoy those too but they have rather been done to death. I don’t know that Henry IV’s second wife has been written about in any detail before so I am so looking forward to reading this new book. We know that when we pick up one of your novels we can be immersed in another world completely and just lose ourselves in that world. Thank you for your wonderful writing. My favourite period is medieval history particularly around the time period of Edward III but I love all of it. It is good to find a novelist that sticks as much as possible to the truth of what actually happened. When it gets a bit far fetched it irritates me because I know it could never have happened in that way. There is no need for it because as the old saying goes, ‘TRUTH IS STRANGER THAN FICTION’. Fascinating post. You bring history alive. Can’t get enough of your work. Would treasure a signed copy. Anne your writing is getting better and better as you continue to write your books. Very pleased with your success. You deserve all the attention you are getting now. Yoyr books are fabulous! I lose so much sleep every night as I just can’t put them down! They take me away from my day to day worries! Thanks for that! Your writings full my soul with admiration and a deep desire to read more of your novels. It would be a great honor to receive a signed copy. Gramercy. Very interesting. You have to wonder how much of the prophecy gave courage to the events. The best chance anyone will get to go back to these magical times is by reading this book. Transported. Here I come. Hello: My name is Vielka Helen Gorriz, I am a reader, the day do not have enough hours for me to read, is to short, medieval is my favorite genre and love to read about all the trouble and suffering of the women in that era, being a woman in that era had to be very hard, I wish I can win this book so I can travel mentally to that time. So fascinating never knew about this ,I’m obsessed with merlin and King Arthur ,now going to have to do some research ,and now also read this book . 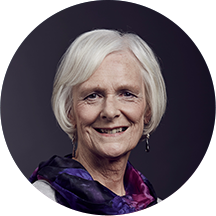 I have not read any of your books but have read all of Philippa Gregory’s, so I am sure I would appreciate them as I am very interested in history. Indeed, in Northamptonshire, where I live there are many historical buildings and places, eg the mound of Fotheringhay Castle and the Church (the tombs of Richard II’s parents lie here), Kimbolton Castle where Catherine of Aragon was imprisoned, and many more sites of battle fields, etc. I love the Tudor period and firmly believe that Robert Dudley and Elizabeth I had a child (I am a Dudley). I would now like to go back previous in history from Henry V and would greatly love one of your signed books. I am also a member of the Richard III Society. Many thanks. Anne, What a fascinating article! Very interesting to ponder on the effect this prophecy would have had. Thank you for posting. In this day and age one could say that Merlin’s prophecy might be self fulfilling. However, in a world based on folklore, myth and legend and without the use of modern technology, it completely mystifies me as to how Merlin seems to have got it just right!! What a fascinating post. I, too, had never heard of this prophesy–and from Merlin? I wonder from whom it actually originated. And if the people in question were aware of it. So many times in life something happens because we expect it to happen–self-fulfilling prophesies. This is a fascinating piece. I’ve never heard of this prophecy before! I would love to win a copy of your book; you are an amazing writer! Thanks for all of the work and posts – I love them. I truly enjoy reading your posts Anne, having Edward lll several times in my ancestry as well as Lionel of Clarence and the Percys et al, it is wonderful to see more flesh put on the bones of ones forebears. When I was a child King Arthur was one of my first books and I gathered up and read everything about Merlin I could find. This prophecy however I did not know about. Thankyou Anne for bringing it to our attention. I hope to read more about this in the future. Wow , what a great article. I can’t wait to read more. Thank you Anne, you continue to educate me with your writings. I have always held the belief that in prophecy and also in legend, there is always an element of truth. Fascinating , riveting , magical…brilliant writing..Thanks!!! Oh, how different England might be today had the tripartite been successful. 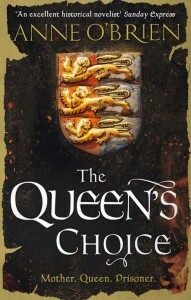 I look forward to reading more about the lives of Joanna and Henry in The Queen’s choice. What a very interesting article. I just recently learned of my Plantagenet Grandfathers. I had always enjoyed that period in English History and to learn that I was a descendant was such an amazing discovery. Do you think that if this “prophecy” by Merlin, whom I believe was a real person, had NOT been revealed or written that the whole of English History would have been different? I know that superstition and the belief in prophecy and portent haunted many Kings (Henry VIII comes to mind right away). I wonder what would have happened if the “prophecy” had never happened? A good idea for another story. Isn’t this notion of prophecy from Geoffrey of Monmouth’s “The History of the Kings of Britain”? Incredibly interesting. I am a history graduate student and the Plantagenets will be my ultimate focus. Look forward to ready this work!